Children play on the inflatables during the Cardington Street Fair in 2016. 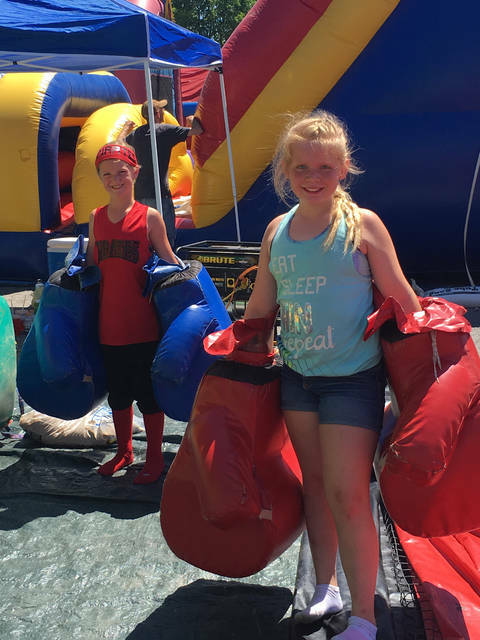 CARDINGTON — The fifth annual Cardington Street Fair will kick off Friday evening, June 22, with a few additions to the two-day event. New this year will be a dunk tank and games for the adults with prizes. There will be food trucks, raffle with baskets donated by local businesses, an acoustic stage, historic display in the log cabin and other attractions. A Wolfpak Martial Arts demonstration at 5:30 p.m. on the Community Park stage. That will be followed by square and line dancing to the music of Roger Cole and the Hickory Run Band. Bingo will be played at 6 p.m. in the Park shelter house, sponsored by Lisa Brake, Realtor. For the children, Bubble Soccer, sponsored by the Cardington-Lincoln Public Library, will be take place in the park from 5:30 to 8 pm along with bounce houses and food trucks. Events will begin at noon Saturday, June 23, with Dino ROAR performing on the park stage at 12;30 and again at 3 p.m. Juggler Michael Hemmelgarn will demonstrate his talents at 2 p.m and the Morrow Little Theatre will give a presentation at 5 p.m. The Cardington FFA Alumni will conduct a pie auction in the park at 6 p.m. followed by entertainment by the Jonalee White Trio at 7 p.m. and McGuffey Lane performing at 8 p.m. This entertainment is sponsored by FC Bank. The Post 97 American Legion home will be the site of three activities beginning at noon with euchre sign-up and followed at 12:30 by the tournament, $10 a player and progressive singles. Colton Snider’s Spiritual Show will begin at 4 p.m. and Rising Stars will take the stage at 5 p.m. An ice cream social will be served throughout the day by Jenkins-Vaughan Auxiliary Unit 97. The fire house on Park Street will become a Science Arena with a live bird program from the Ohio Bird Sanctuary, the Reptile Guy and Robotics from 3 to 5 p.m. sponsored by The United Way of Morrow County. Events on Second Street will include a Sanctioned Pedal Pull with sign-ups to begin at 1 p.m. for ages 4-11 with free entry. The pulls begin at 2 p.m. and will be followed at 4 p.m. by adult pulls for ages 11 and older and a $5 entry fee. This event is sponsored by Lubrication Specialties, Inc. The Cardington Public Library will host a Story Walk behind the shelter house throughout the day. Doug Brown will conduct his fifth annual clinic at the Skate Park at 1 pm and 5 pm. There will also be a rock climbing wall and Bubble Soccer, a first-time event, will be played in the park at 5 p.m.
Children can purchase a wrist band for $5 for the day which will give them unlimited fun on the Dixie Twister, the Wizzer, rock climbing wall, extreme obstacle course, inflatable figures, pony rides, putt putt golf, archery and train rides. The wrist band includes eight tickets for the children’s games and more tickets can be purchased, three for $1. Capping off the fair will be the fireworks display at 10:15 p.m. Saturday, June 23, sponsored by Cardington Yutaka Technologies.